In the world of equines it is understood that there are a wide variety of horse breeds, however within the horse world (and even some breeds) there are a number of types. Not all of the types listed below are officially recognized & some of them overlap. However they are used within the various industries in the horse world & are a different way of categorizing the equine animal. Baroque animals tend to be handsome & showy, often with high action & arched necks. Almost all animals considered Baroque in type come from Iberian bloodlines & breeds include Andalusian, Lipizzan, Lusitano & Friesians. Coldblooded animals are larger, draft breeds who possess immense strength & robust size. Draft animals come from ancient European breeds used for agriculture or war mounts & include Clydesdale, Percheron, Belgian Draft & Ardennes. Gaited animals come in all shapes/ sizes & most likely originated with the Iberian animals. These breeds are known for their smooth, ridable gaits, handsome demeanor & include American Saddlebred, Bashkir, Icelandic Horse & Paso Fino. The term Hotblooded does not have anything to do with temperament, it is descriptive of smaller, leaner animals with thin coats. These breeds often come from the desert & include Akhal-Teke, Arabian, Barb & Thoroughbreds. Miniature horses are pony size in stature but retain horse-like characteristics, making them literally miniature horses. In many cases mini’s are man made breeds, like the American Miniature however there are a few naturally occurring small animals with horse features including the Caspian & Falabella. Pacers occur in several different breeds & are generally used for racing. They are fast & move with a lateral two beat gait. This is a natural gait & many breeds prefer it to trotting, including the Canadian Pacer, Narragansett Pacer, Kathiawari & Standardbred. Ponies are all small in stature & tend to have rounded bodies, relatively short legs, specialized joints & molars (that’s just a few characteristics). The confirmation of ponies will vary considerably as there are a wide variety of pony breeds including the Anadolu Pony, Connemara Pony, Java Pony & Padang Pony. Riding horses aren’t a specific type per se, but they deserve a mention nonetheless because this has long been a popular mount. Riding animals are bred specifically for their mild temperament, comfortable ride & include the Russian Riding, Selle Francais, Romanian Saddle Horse & Irish Hobby Horses. Sport Horses have gained popularity in recent years & are generally used for eventing, competition or showing. These animals tend to be large, athletic, intelligent & include the likes of the Brazilian Sport Horse, Canadian Sport Horse, Irish Sport Horse & Belgian Sport Horse. Under the same vein as the Sport Horses, the Sport Ponies are mainly used in the show ring & can be found in various disciplines. These breeds generally display more horse-like characteristics & include the Danish Sport Pony, American Sport Pony, British Riding Pony & German Riding Ponies. Stock Horses serve a specific purpose & are built to show it. They are shorter, stockier animals who often have heavy hindquarters. They are generally used to work cattle & various other ranch or farm tasks, some stock breeds are the Quarter Horse, Australian Stock Horse, Florida Cracker Horse & Canadian Cutting Horses. Stock Ponies serve much the same purpose as Stock Horses but for smaller cattle & a wider variety of work tasks. Built in a similar manner, these breeds are squat, stocky & built to work. Stock pony breeds include the Quarter Pony, Dulmen Pony, Galiceno & Lac la Croix Ponies. Most harness racing is run by trotters who are built long/ lean & can trot at high speeds. These tend to be rangy, robust animals & there are are both warm & cold blooded trotting breeds including Dole, Italian Trotter, Russian Trotter & Orlov Trotters. Warmblood horses are in many cases saddle or riding horses whose development changed as equestrian sporting grew in popularity. These animals tend to be robust, athletic & mild mannered – often registered based on movement, temperament & ability. Warmblood breeds include the Dutch Warmblood, Holsteiner, Hanoverian and Belgian Warmblood Horses. This is the longest list of horse types we could find, but if anyone has a type to add we’d love to hear it. 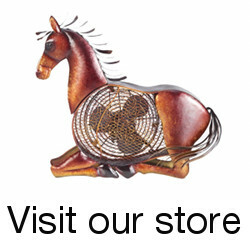 Be sure to check out the Breeds section to learn more about all horse types. This entry was posted in Horse Basics on August 7, 2010 by The Equinest. How about Pasture Ornaments, Cash Converters (dollars to poop…), oh, I could go on but I will stop there :). 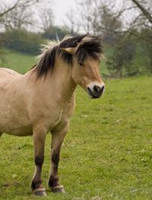 the Falabella was a miniature horse breed developed by the Falabella family of south america. the caspian is not a miniature, it is a small horse about the size of a small pony. oh lordy i’m giving away my entire book! Hotbloods does in a way refer to temperament as well. Yes not all hotbloods tend to be aggressive, I ride a few thoroughbreds that has a very docile and trusting personality. Hotbloods has influence on temperament. Hotbloods are highly strung, strong, excited, frisky, and/or “hot” meaning they are easily trainable, they are focused, intelligent, easy of the leg/forward going (not lazy animals), “hot” (meaning they like fast gates) etc. So yes that is why hotbloods and warmbloods are great, agile performance horses. You won’t see a coldblood participating in a discipline such as endurance, show jumping, eventing and so. It also has influence on the horses’ external features. Hotbloods are refined breeds, where coldbloods are stocky, robust breeds. Coldbloods such as the clydesdale are know as gentle giants. You rarely (may never) see a coldblood with the temperamental features of a hotblood. And you would rarely see a hotblood with temperamental features of a coldblood. So my opinion, I beg to differ, but being hotblooded or colblooded is a genetic feature an does have influence on a horse or breed temperament wise. You won’t get lazy hotbloods and you won’t get “hot” coldbloods. did you know that ragweed is a toxic plant to all horses?